“Who Could That Be at This Hour?” is the first in a brand new sleuthing series from well know children’s author, Lemony Snicket. Lemony Snicket (the name of the main character as well as the author) is about to turn thirteen and is on the way to meet his new chaperone to start work for an unidentified ‘agency.’ Her name is S. Theodora Markson, ranked lowest of all the chaperones and chosen for that exact reason, as Snicket has other ideas for his spare time. She thunders into his life, upsetting all his plans by leaving town and driving him away to an intriguing little place called Stain’d-by-the-Sea. A place that’s no longer by the sea, that gets its ink from scared octopi in underground caves and has alarms for salt extract in the air….of course! Here they find their first case. A stolen figure of a mythical beast called the Bombinating Beast must be returned to its rightful owner. But why does everyone want the figure, was it ever really stolen and why can’t Snicket ever ask the right questions? If you’re not aware of Lemony Snicket’s previous collection of books ‘A Series of Unfortunate Event’ a) go buy them now and b) you are in for a treat! Snicket’s quirky, sarcastic and dark writing style crosses over into his new series but with an added crime noir feel. With creepy locations, sinister characters, damsels in distress and hints at an unusual past, this book comes with just as much atmosphere as many adult novels but with a wit and humour that breaks the seriousness. I am sure many people will be wondering what his new series is going to be like and judging by this first novel, it’s going to be a corker! You also can’t ignore just how beautiful the book is. The cover design and accompanying illustrations by Seth fit perfectly with the story and just add to the overall impact. Now I just can’t wait for the next in the series! 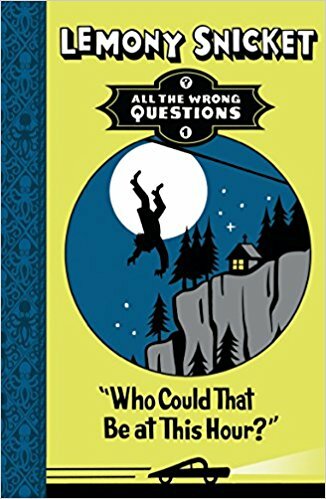 All The Wrong Questions, book recommendation, childrens book review, Lemony Snicket, the tattooed book, thetattooedbook, Who Could That Be at This Hour?